Lawrence Chikwa has just returned from Zimbabwe where he was invited to exhibit in an international show entitled 'Beyond Borders' held in honour of late Mozambican painter and poet Velente Malangatana who died early this year. Hosted at the National Gallery of Zimbabwe and curated by Raphael Chikukwa, the exhibition was part of this year's Harare International Festival of the Arts (HIFA) and involved about 50 artists from Zimbabwe, Mozambique, Kenya, Uganda, Botswana, Germany and Sweden, with Chikwa being the only Zambian. The artist has considerable study and exhibition exposure in Europe, and has given the Weekend Post several interviews before. But returning from neighbouring Zimbabwe, he appears to come back with a strong admiration not for the works he has seen nor an excitement for exhibiting in the same gallery as Malangatana, but by the unity of the artists, young and old with whom he mingled. "The conflicts of the generation gaps that we have in Zambia, I didn't see them in Zimbabwe. In Harare, the conflict between senior and upcoming artists does not exist, everyone works together. I even met Tapfuma Gutsa (a Zimbabwean sculptor of international acclaim) and we spoke at length. He asked so much about Zambia and told me he studied with Flinto Chandia (a Zambian sculptor) in London during the 80s," says Chikwa. He explains that for him, the Harare experience is not just important because he exhibited, but he thinks its also important in how he now views the disunity on the Zambian scene. The 37-year-old believes Zambian artists have to 'come back together' and that if someone in his generation does not make a move, the visual arts will continue to suffer what he describes as an inertia towards development that has crippled the sector for decades. "We have been having this problem for over fifteen years or so. In fact, it is a two way thing; there are older artists who think too much of their seniority and then there are younger ones who think so much of their international exposure and therefore cannot be told anything," he says. "There is need for us to come together as artists. If you hold a talk or discussion at a certain venue, some people won't come. So if I was to present a paper, I would rather do it on neutral grounds, such as here at The Post". For any dedicated observer of Zambian visual arts politics - including the generation wrangles that Chikwa mentions - one would want to agree with him and acknowledge that his assertions hold true. Cynicism has been at the very core of the arts' internal politics. In fact, it is tempting to describe the scenario as a microcosm of the bigger Zambian political picture and furthermore enticing to borrow from a past editorial comment entitled "A nation of cynics" published in The Post of January 11, 2005: "Cynics have never built any nation or community. There's need for all of us to accept and respect the right of every citizen to participate in the building of this nation," read the editorial in part. In the arts context nonetheless, it can be said that cynical artists young or old will never build a viable and self-sustaining arts community. There is need for every artist to accept and respect the creative right and ability of every artistic citizen to participate in the building of this creative industry. In conclusion, the 2005 editorial read: "Whatever contradictions arise among our people, let's resolve them through unity. By this we mean that we have always to start from the desire for unity, resolving contradictions through criticism or struggle and arriving at a new unity on a new basis. It is imperative to overcome anything that impairs unity in the nation because without unity, we won't make any meaningful progress." Now that definitely needs no paraphrasing because in any context, it speaks for itself. 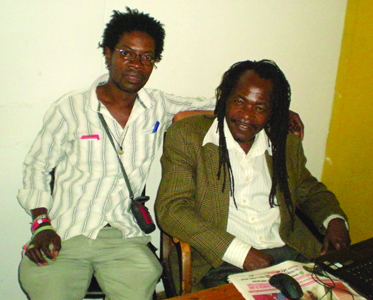 So, Chikwa's cry and newfound energy to champion unity among artists has to be supported. It is surprising how artists, no matter how much international exposure they seem to be getting, find it so hard to work together in a fledgling visual arts sector such as Zambia's. The blame is often thrown at the lack of public support when indeed the artists themselves are not united. It is only at a time when they do so that there will be any meaningful progress for arts advocacy. Chikwa showed 7 works during this year's HIFA exhibition. HIFA is a 6 day annual festival and workshop programme that showcases the very best of Zimbabwean, regional and international arts and culture in a comprehensive programme of theatre, dance, music, circus, street performance, spoken word and visual arts. According to Professor Luc Rukingama of the United National Eductational Scientific and Cultural Organization (UNESCO) in a forward for the Beyond Borders exhibition catalogue, for over a decade now, UNESCO has partnered with HIFA and during the past two years, UNESCO has focused specifically on support towards exposure of visual arts during the festival with an objective to provide marginalised Zimbabwean artists a platform on an international stage. Surely, what would stop UNESCO supporting a 'Lusaka International Arts Festival' (if there were ever to be one in our life times), or supporting marginalised Zambian artists by helping providing an international platform? You guessed right; a cynical and disenfranchised arts fraternity who do not even have a Lusaka Arts Festival in their thoughts. IS it possible that a heritage as diverse and complex as Zambia’s museums can be summed up as just storerooms for relics? Probably not. Livingstone Museum for instance, Zambia's oldest, is not just a storage for some personal belongings of a 19th century Scottish explorer - Dr David Livingstone. Livingstone Museum actually is a blend of scents, sounds, colours and gives an anecdote of Zambia’s cultural heritage, history in motion – all in one building. But in a country whose majority of citizens are clearly a "non-museum- going" people, if there was ever such a term, it is easy to fall prey to such beliefs. An amateur workplace survey taken by the author revealed that not even one in 20 workmates had ever set foot in a museum, and imagined that Zambia has six dotted across the country. Many see museums as stops for tourists and school pupils and as such, not even the average entry charge of K2,500 is able to attract them. Well, a word to all museum skeptics or "non-museum-going" folk, you do not know what you are missing. Take the largest, Livingstone Museum for instance. 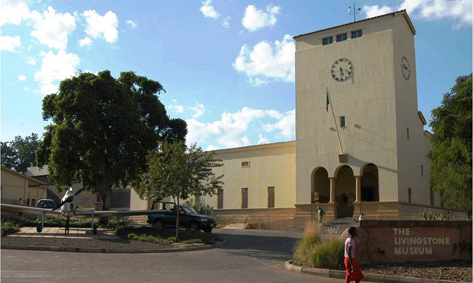 It has several galleries that show everything from the relics of the prehistoric inhabitants of Zambia to British colonial rule, to the struggle for independence as well as a large collection of David Livingstone’s personal items that include hand written letters, journals and maps. The introduction area, right under the clock tower that was once rumoured by locals to house storage for dead bodies has a scale model of the Victoria Falls and its gorges. The most striking feature in this area is a colossal wood carving of an Ila Chief called Mukobela, by Ivan Mitford Barberton. Here, there is not much to see, but as you enter the Natural History galleries, the first being the Archaeology gallery, it becomes more interesting. It is aptly labelled; "The Origins Of Humans In Zambia". The display tries to put together remains from the earliest settlements as well as provide maps depicting Ethnographic migrations of Zambia's modern day inhabitants. 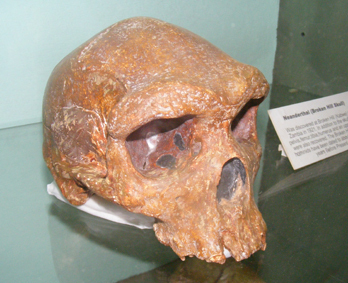 Among the key features here are a die-cast replica of the Broken Hill Man, or discovered in Kabwe in 1921, unfortunately for purists, the original fossil which is said to date back to about 200,000 years-ago has been in the UK since the find was discovered. Also notable is a rock painting extracted from the Nachikufu Caves near Mpika that depict a hunter chasing an eland, a type of large antelope that no longer exists in that area, then there is a skeleton from 700 AD excavated from Isamu Pati mound near Kalomo. Then there is the 14th Century copper bracelets from the Ing'ombe Ilede site in Southern Province. Interestingly, Copper was never mined in this area, so this suggests that there was trade between the ancient inhabitants of this area with the people of the interior, what is now Congo. As you exit the pre-history area, the visit takes you to a section labelled "Our Village", which basically gives an insight into modern day village life. Here, you reach a 'fork in the road' and have the option of either continuing with a "Natural Environment" tour or go straight to the "Your Town" section. The "Natural Environment" gallery displays an array of meticulously preserved animal specimens; reptiles, birds and mammals, including a rare treat such as the Black Lechwe which is only indigenous to Lake Bangweulu in Zambia. A visit to the "Your Town" mimics the urban migration from hence the "Our Village" to "Your Town". Through models, this display interestingly tries to portray what village folk go through when they migrate to the city for 'greener pastures'. This area has an interesting and nostalgic collection of grocery products that disappeared from supermarket shelves years ago. Older Zambians may recognise popular products of the past such as "Wendi" and "Dynamo" detergent pastes. Still within the ethnography galleries, the tour continues through a number of displays showing artifacts from initiation rites, marriage and long lost crafts such as cloth made from the bark of trees. Further down we find a display of herbal remedies and traditional belief systems that include witchcraft and sects that involve ancestor worship and border on Zionism. Featuring, quite prominent here are witches, or sorcerers tools such as "lilombamema" a ghastly looking bundle of beds, cloth and reptile skins that is said to have been used to kill people by supernatural means. 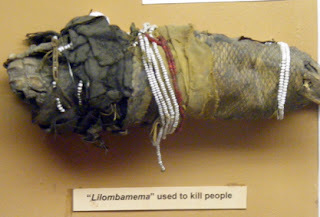 It was discovered by a witch finder in Dambwa Site and Service, Livingstone. The nearby community alerted the museum of the discovery and the witch-finder who confiscated it then donated the 'defused' item to the Museum. There is also a "kaliloze" gun used for similar purposes and a wooden, streamlined "aeroplane" the size of a wine bottle that looks like a cross between a speedboat, a jetfighter and a submarine. This is said to have the power to fly its occupants to any destination under the cover of night. It is also said to be propelled by human blood. The tour is temporarily disrupted at this point as viewers have to exit the galleries on to a Spanish-style courtyard, but it continues through the David Livingstone gallery which displays some of the explorer’s original, personal effects, clothing, guns and signed letters. From this point on, the gallery display takes the visitor on a journey through the history of Zambia from 1500 to 2001. It focuses on the early chiefdoms and later kingdoms and people from the outside world such as the Swahili, the Arabs the early European settlers, slave traders and missionaries. The themes summarised here are the colonization process, colonial rule, the federation of Rhodesia and Nyasaland, nationalism or the struggle of independence; achievement of independence and the Independence Day celebrations on 24th October 1964. 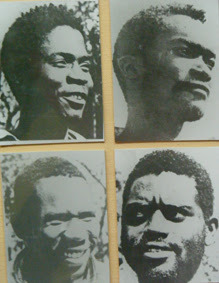 On display are some very rare and interesting images of the struggle heroes such as Donald Siwale, founder of Mwenzo Welfare Association, Kapasa Makasa who galvanised Northern Province during the struggle, Paul Kalichini whom alongside Frank Chitambala founded ANIP a party which later merged with UNFP to form UNIP and Munukayumbwa Sipalo, a charismatic nationalist leader whom the colonial government considered a radical communist to name a few. It is quite moving to see images of men and women who were ready to lay down their lives for the freedom of their people a clearly selfless breed of leader of whom Zambia has long been bereft, leaders with the people at heart, if only the same could be said of contemporary Zambian leadership, so much for the struggle. 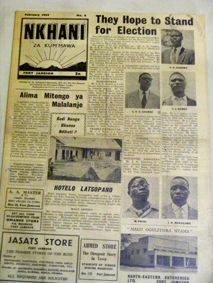 It is in this gallery that you can also find a copy of a letter of encouragement written on toilet paper by Kenneth Kaunda that was smuggled to his comrades during the struggle, there are also images of the earliest 'native' newspapers form the 1950s, "Lywashi" and "Nkhani Za Kum'mawa". The tour ends on a completely political note with themes from the First Republic, the Second Republic and finally the Third Republic, seeing us through Kenneth Kaunda, Frederick Chiluba and Levy Mwanawasa. At this stage you would have forgotten about your journey into time at the beginning of the tour, the rock painting extracted from the caves of the Kalambo Falls, the skeleton from 700 AD excavated from Isamu Pati mound near Kalomo and the 14th Century copper bracelets from the Ing'ombe Ilede site in Southern Province. Nevertheless, as a Zambian, one leaves the museum with a rekindled sense of identity and an inspired urge to "Stand and sing of Zambia" as per National Anthem. 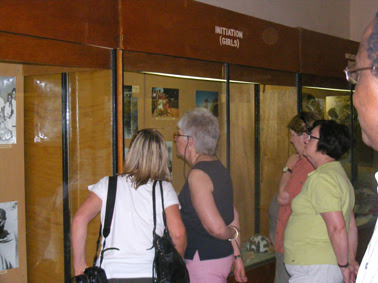 Having viewed the galleries, any visitor to the Livingstone Museum would leave content that they have had their fill of the institution’s treasures. But in fact what is on display for public viewing is not even 5 per cent of the museum’s catalogued artifacts. Not open to the general public is a labyrinth of corridors and storerooms, that people do not even know exist. Fortunately the author was given a personalised tour of the inner recesses of the museum by the director himself, Victor Katenekwa. Katenekwa and his expert team of anthropologists are in fact a lot more than a band of museum staff who dust off old bones and artifacts for a living. His is a team of Herpetologists (who study reptiles and amphibians), Entomologists (who study insects), Osteologists (who study detailed bone structure), video production specialists and archivists whose job is to painstakingly collect, document and catalogue every manner of insect, animal and cultural activity in Zambia. Much of this work cannot be appreciated by the public because they do not even know that it is being undertaken. One can only stare in wonder as the likes of Peter Chitungu assistant conservator- natural history specimens opens drawer after drawer of both common and rare insects, points out shelf after shelf of animal bones and hides, lions, leopards and kudu. But it is the spine-chilling chambers overseen by Mungoni Sitali senior keeper responsible for ethnography and art that leaves one in wonder. Here several 'defused' gadgets formerly used for sorcery can be found among the witchcraft collectio,n some of which are even strewn across the floor. And as you enter, the thought of the gadgets still having their potency crosses the mind. But alongside the witchcraft can be found hundreds of traditional stools, masks and weapons from all over Zambia. The museum’s famous tower is used for storage too, but contrary to the urban myth, it doesn't house dead bodies. It’s storeroom for thousands of the nations earliest documents and newspapers, here you can find the likes of Kingsley Choongo, assistant conservator-paper and archives, carefully cataloguing documents that are now in the process of being digitised. When all the documents are digitised visitors will be given passwords with which to access the virtual archives of the museum. Although all these areas are out of bounds to the general public, upon request, by directly writing to the director, researchers may be given access to certain areas. But as can be seen, there is more to museums than collection of old bones and archives, maybe they can best be described in the words of executive secretary Flexon Mizinga: "As museums, we are generally the custodians of the country's heritage. And also for the purpose of future generations to know who we are, and where we are coming from. But in a nutshell, the national museums were created so that the country's heritage is collected, interpreted, documented and preserved". And Clare Mateke a mammalogist (studies mammals) at the Livingstone museum challenged locals not to leave museum visits to tourists. "Don't wait for foreign guests to ask you to take them to the nearest museum. We should not see museums as places for tourists" she says. Mateke also emphasised that Zambian museums are not just one off displays of artifacts, but they are research institutions that are constantly studying the past and present and networking with similar institutions across the globe. Scrapbook: Did you know Akwila Simpasa? Ismail Mahomed, Director of South Africa's annual National Arts Festival, recently hit the proverbial hammer so hard on the nail's head that the echo of his opinion is food for thought not just in SA but is one of generic importance across the African continent, well, at least to nations with a semblence of democracy, Zambia inclusive. This is also considering the Visual Arts Council will be voting for their leadership at the AGM a few weeks from now and also the presidential elections are scheduled for the final quarter of this year. "The arts are hardly ever the subject of an elections campaign. So, it is quite likely that even artists will go to the polling stations to cast their vote without even pondering what their vote could mean for the sustainability of their own livelihoods," writes Mahomed in his personal capacity in an article published last month on Artslink, a South African culture and entertainment news wire. Mahomed observes that voting for a government that is arts-sensitised can have a significantly positive and distinctly competitive impact on the health and quality of how an arts sector functions, grows and contributes to the economy. He writes that the health of an arts organisation and its creative industries is a defining element of a community’s image and a key facet of its economy and that the arts are also an important resource through which a community educates its younger generations. "A commitment to support the arts must be non-negotiable thing that every artist should expect from the political party or candidate for whom they intend voting. It is the responsibility of artists and arts-sensitised voters to ensure that a strong and vibrant arts sector is supported by election candidates who will advocate for local government funding for the arts" reads the article in part. He argues that politicians and political parties who do not recognise the arts as a wise investment for any community will not promote programmes that contribute to the cultural tourism sector. Most, if not all of Mahomed's concerns apply to Zambia too. But in the run-up to elections, there still seems to be no political party that appears to have a specific or cumulative plan for the creative industry or at least the creative society. How pleasant it would be to see politicians visit art galleries, theatre houses or even live concerts and assure artistes of a progressive plan for the arts, even half-truths will do, such as promising artists (as per Unesco recommendation) that they will allocate one per cent of the building budget for public structures to the purchase of locally produced artworks. When push comes to shove, the issuing of half-truths is almost considered standard practice during every election, judging from the recent past. But maybe Zambian artists are not doing enough to be heard or seen. Do politicians even know that artists exist? Are artists too silent and invisible? Maybe so, after all, unlike the Henry Tayalis and Akwila Simpasas, the leading visual artists of the independence era whose works were politically assertive, the Zambian artist of today does not seem to have any political opinion whatsoever. They appear to have assumed a role of producing work merely for decorative purposes. This assumption is not restricted to visual artists. Nevertheless, even their kin, the actors and musicians, do not seem to be expressive politically. In theatre, not since Benne Banda and late Augustine Lungu's Samangika in the early 2000s have we seen any thought-provoking play. The play was set during elections in a newly democratised state. It portrayed how the benefits of democracy eluded an electorate, particularly the poor. It is compelling portrayal of how leaders forget their promises and the electorate loses faith in the electoral process. In music too, not since late Kalindula supremo PK Chishala's Common Man a song that, as the title suggests talks about the struggles of the common man and appeals to leadership to lend an ear to the cries of the poor whom without their vote, the leaders will not be in power. Nevertheless, to avoid continuing to jeer Zambian artistes or label them scaredy-cats with regards having a political outlook or voice, it would probably be wise to again return to Mahomed's counsel. "When artists and those who earn their salaries from arts organisations vote for political candidates and political parties who do not care for the arts they can expect local government councillors who will not spend any money on acquiring artistic assets for their city’s collection. Neither will these councillors work towards growing art in public spaces." he continues. He observes that politicians who are arts sensitised will safe guard the artist’s rights to freedom of expression and creativity. Artists who go to the ballot box should make it a point to vote for political candidates and parties who will not limit their freedom of expression or creativity. Mahomed however does become more uncompromising towards the end of his article. "If a political party makes it harder to access the arts, vote against it. If the party has no policy about how it will grow and support the arts economy, vote against it. If the party fails to give greater recognition that the arts are a vibrant part of the economy, vote against it." he declares. Mahomed is an accomplished playwright with more than twenty years of experience in the performing arts sector he holds several awards for theatrical excellence. As earlier suggested, Mahomed's strong-minded opinion is one of generic importance in any reasonable democracy and can be applied to Zambia. There is much in it that the local creative community as well as elected officials who do not seem to have the poltical will to support the arts may want to take into consideration, it is not too late. What is continuously worrying however, is that with every regime change, the political will to support the arts, has been on a downward trajectory since Zambia's independence. For the visual arts its tempting to reminisce with a brief history of the National Art Collection as provided through a speech by Cynthia Zukas during the opening of an exhibition a few years ago: "At independence the newly-formed Department of Cultural Services under its first director Mutumwena Yeta had the vision and enthusiasm to start building a National Art Collection. He had the full support and encouragement of president Kaunda." read the speech in part "… after 1972 or '73 the purchasing grant got less and less, and the committee (Art Centre Foundation) sometimes had to plead with the Department to get at least something each year, so very few new works could be bought".